Let me start by saying if you are in any way interested in working in the Fashion industry, this book is a must read. I am actually really happy I chose this as the first read. 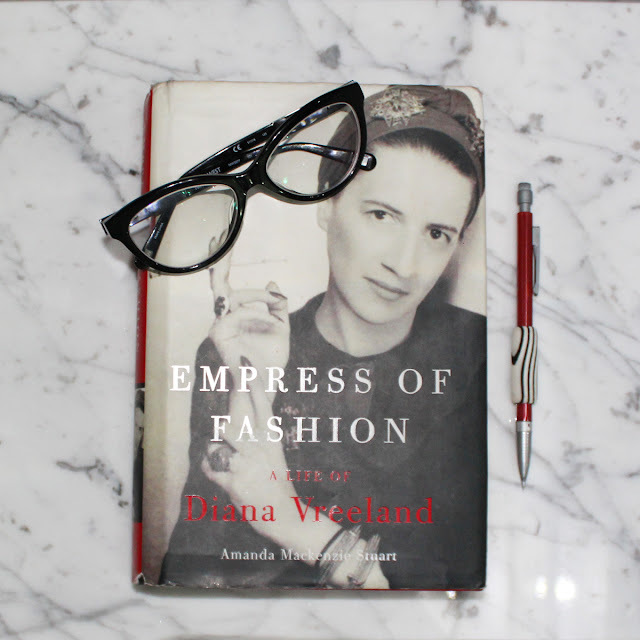 Prior to reading this book, I had only known of Diana Vreeland as THE HOLY GRAIL of Editors and BOSSEST BIH of her generation. Thanks to Stuart, I was able to gain an intimate look into this exceptional lady's life in 300 pages, that was not just informative but enchanting. 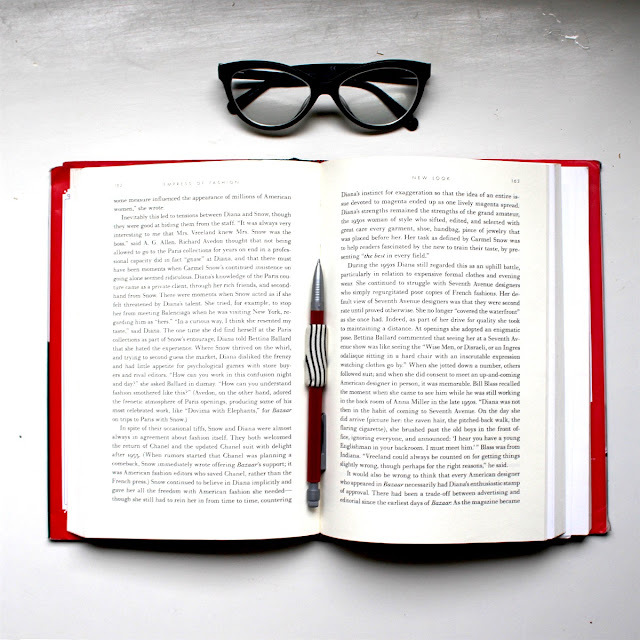 i. is a source of inspiration: Diana's story is a unique one that proves that your mind is a powerful tool and that the way you think will ultimately determine your life's experience. We see a socially inhibited girl blossom into a rare swan after a decisive plan of action to become "The Girl" everyone loves and admires. Her successful reinvention of herself is a testament that you become what you repeatedly think and as the author so rightfully states "only she had the power to make her life as she wanted it to be", a lesson we should all be keen on. ii. has life lessons and philosophies to live by: One of my favourite quotes from Diana goes- "There's only one very good life and that's the life you know you want and you make it yourself.' This sums up the essence of her existence; a woman who created her own rules and lived life on her own terms. It makes sense why she would suggested that one should: "Keep your secrets. That is your power over others." As detailed as Stuart's biography is, there were many missing details about Diana's personal life; having taken her own advice she was able to maintain a reputation based mostly on her work, minimising gossip and so was able to lead a private life in spite of her popularity. In this digital age, this is something we should certainly heed. iii. a reminder that your imagination is one of your biggest assets: Diana once expressed "The fact that people don't still dream, I don't understand!" Everything about Diana was imaginative. It was undoubtedly her secret weapon throughout her career and the true reason for her success. In fact she told an associate editor once that the trick to being successful within a creative field is to give people what they never knew they wanted, "a dream." Her imagination lead to constant innovation and iconic ideas that even today still define the Fashion world as we know it. Simply put, as artisans we must be committed dreamers. iv. offers a discourse in history that takes us through the evolution of fashion. We see how some of the most important world events such as World War II affected the industry and become privy to the launch of brands such as Dior and superstars career such as Lauren Bacall. The introduction of coloured photos and ready to wear collection, an insider on the early life of two of the world's most celebrated magazines Haper's Bazaar and Vogue, styling the first lady, Jackie-O, and having muses in the likes of the iconic Cher and Mik Jagger are a few of noteworthy mentions in Diana's biography. v. explores the life of one of the most eclectic and stylish women to ever walk this earth: She impressed that, “Style—all who have it share one thing: originality.” Diana defined original. She had "rare taste" and Stuart's biography captures this "divine spark" that permeated everything she touched including her children, husband, her homes and the pages of the magazines she edited. She was a visionary who earned iconic status through her unprecedented ideas. We are all beneficiaries of her legacy in some way or another and for that, she was indeed legendary. Putting this on my list! Thanks for sharing - sounds like a really great read!